In this article, we would like to introduce our work on the spi-mem Linux kernel framework, which will allow to re-use SPI controller drivers for both SPI NOR devices and regular SPI devices, as well as SPI NAND devices in the future. But then SPI memories appeared. It started with small and relatively slow ones, like dataflash, EEPROMs and SRAMs and progressively moved to rather large SPI NORs and SPI NANDs. As usual when it comes to dealing with memories, we want to get the best performances out of them. SPI bus limitations quickly became the bottleneck, so vendors decided to add more I/O lines and make the MISO/MOSI lines bi-directional. Nowadays we see SPI controllers that are supporting up to 8 I/O lines. For those who are familiar with the terms, that’s what we call DualSPI, QuadSPI and OctoSPI. Note that, while this protocol tends to be used by memory devices, there’s nothing restricting it to memories, and I wouldn’t be surprised if some FPGA were using the same kind of transactions for things that are not memory oriented at all. Linux has been supporting Dual and Quad SPI mode for quite some time already (v3.12), and SPI device drivers could specify the number of I/O lanes for each SPI transfer. This way, a SPI memory operation could be broken out in several SPI transfer each of them using a pre-defined number of I/O lanes. That worked just fine until some IP vendors decided to make their SPI controllers smarter and embed some kind of high-level interface to execute SPI memory operations in a single step instead of splitting it in several transfers (actually, most SPI controllers are even smarter than that and allow you to directly map a SPI memory in the CPU address space, but let’s keep that for a future post). At this point, we needed to give more control to the SPI controller so that it could decide what to do exactly, without having to reconstruct a SPI memory operation out of a group of SPI transfers. At that time, the decision has been to dedicate those controllers to one single task: control SPI NORs (which were the only user of quad and dual mode back then), and the SPI NOR framework was created for this reason. Due to this decision, we now have in Linux a SPI NOR frame work which connects SPI NOR controller drivers to the SPI NOR logic on one side (spi-nor subsystem), and we have regular SPI controller drivers which can do basic SPI transfers (spi subsystem). However, from a hardware point of view, advanced SPI controllers that provide special features for SPI NOR can often also do basic transfers, and therefore control regular SPI devices. Unfortunately, with the current split between the spi-nor and spi subsystems, if a SPI controller is supported by a driver in the spi-nor subsystem, it cannot be used to communicate with regular SPI devices normally managed by the spi subsystem. As a partial solution to solve this problem, the ->spi_flash_read() operation was added to struct spi_controller. This allowed regular SPI controller drivers in the spi subsystem to provide an optimized way to read from a SPI NOR memory, which is used by the generic SPI NOR driver m25p80. However, this solution is partial, as it only optimizes reading and is limited to SPI NORs. Specialized SPI NOR controllers, which support advanced SPI controllers dedicated to SPI NORs. What led us to propose the SPI memory interface? We’ve seen before that the SPI NOR case was already properly supported thanks to the SPI NOR framework. But NORs are not the only memory devices you’ll find on a SPI bus, SPI NANDs are becoming more and more popular. 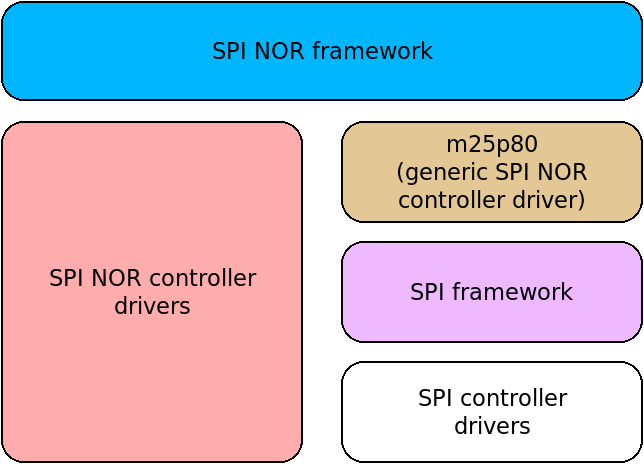 Peter Pan proposed a framework to handle SPI NAND devices which was following the SPI NOR model: SPI controllers had to implement the SPI NAND controller interface in order to control SPI NANDs. But when we got more deeply involved in this development, we quickly realized how messy it would be to follow this path, because that meant forcing SPI controllers to implement both the SPI NOR and SPI NAND interface if they want to be able control both kind of device. And what will happen when the trend will be at SPI NVRAM or any other kind of storage manufacturers decide to put on a SPI bus? Adding yet another interface that SPI controllers would again have to implement didn’t sound like a good idea. So instead, we decided to take the problem from the other end, and tried to figure out what SPI NANDs and SPI NORs have in common. The instruction set is different, the behavior and constraints are different (mainly due to NOR vs NAND differences), but they both follow the same SPI memory operation semantic when interacting with the device, the same one advanced controllers are trying to optimize. The SPI memory layer is just a way for SPI controller drivers to be passed high-level SPI memory operations instead of letting them handle SPI transfers and try to optimize them themselves. It also simplifies SPI memory drivers’ life, since all they have to care about is sending SPI memory operations based on the SPI memory specs. No need for a complex, constantly evolving, memory dependent interface. With this new stack, both SPI NOR and SPI NAND can be supported on top of the same SPI controller drivers. The m25p80 driver is modified to use the spi-mem interface instead of the limited ->spi_flash_read() interface. For now, we still have dedicated SPI NOR controller drivers, but the goal is to rid of them, and implement them as regular SPI controllers in drivers/spi. Help and contributions in this direction are very welcome! What does the SPI memory API look like? The SPI memory API is exposed in include/linux/spi/spi-mem.h. SPI device drivers who want to use the SPI memory API should declare themselves as spi_mem_drivers and implement the ->probe() and ->remove() functions. They will be passed a spi_mem object which is just a thin wrapper around a spi_device object. The reason we have a different object is because we want to be able to extend the spi_mem object and attach more information to it if required (like the type of memory, the memory organization and other kind of information advanced SPI controllers might want to know). When a driver wants to execute a SPI memory operation, it will fill a spi_mem_op struct and call spi_mem_exec_op(). One can also test if a SPI controller is supporting a specific memory operation with spi_mem_supports_op() or try to split data transfers so that they don’t exceed the max transfer size supported by the controller with spi_mem_adjust_op_size(). Note that when spi_mem_ops is not implemented, the core will add generic support for this feature by creating SPI messages formed of several SPI transfers, just as the generic SPI NOR controller driver (named m25p80) was doing before. As you can see, the API is pretty straightforward, so hopefully, more SPI memory drivers will be converted to use it instead of manually creating SPI messages containing several SPI transfers. The spi-mem layer itself, in commit c36ff266dc82f4ae797a6f3513c6ffa344f7f1c7. The two SPI controller drivers who were implementing the ->spi_flash_read interface now implement the spi-mem interface instead: bcm-qspi and ti-qspi. The ->spi_flash_read interface is removed in commit c1f5ba70decfc2f35edcc10505e3e78fb528d212. The m25p80 driver is modified to use the spi-mem layer in commit 4120f8d158ef904fb305b27e4a4524649faf3096. Advanced SPI controllers can do more than just optimizing the execution of SPI memory operations, they can often hide all the complexity of memory accesses behind a directly-mapped IOMEM region, which, every time it is accessed, triggers a SPI memory operation on the bus and retrieves or sends the data for you, thus behaving like a memory that would be placed on a parallel memory bus. As you can imagine, this allows for even higher throughput and less CPU time consumed for SPI mem op management, but it’s also something that is hard to expose in a generic way. We have posted on the linux-mtd mailing list a proposal to support such a direct mapping capability. As detailed earlier, another challenging topic is the conversion of all SPI NOR controller drivers to the SPI mem model so that all QSPI controllers are really exposed as SPI controllers and not SPI NOR controllers. This is likely to take a bit of time since we currently have 10 drivers in drivers/mtd/spi-nor and we’re only aware of 2 of them being converted to the SPI mem approach (fsl-quadspi and atmel-quadspi). Thanks for the really interesting post and your work on the SPI framework, nice job!